Blue Mesa Reservoir, located in the Curecanti National Recreation Area, is Colorado's largest body of water. 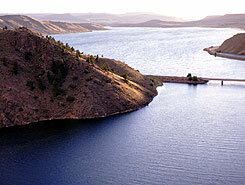 The reservoir is located in Western Colorado between Montrose and Gunnison at an elevation of 7,519'. 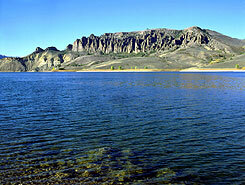 Formed by damming the Gunnison River, Blue Mesa Lake is one of the three reservoirs formed from the Gunnison River. Also located in Curecanti National Recreation Area, the other two reservoirs are Crystal Reservoir and Marrow Point Reservoir. The area is filled with beautiful mesas, deep narrow canyons, and fjord like lakes. Covering 41,972 acres, the park brings over 960,000 visitors each year. One of the best deals in the state: there is no entrance fee. Life on a lake presents many exciting activities to pursue. 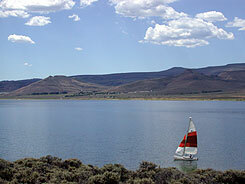 The Elk Creek Marina on Blue Mesa Reservoir offers many services. The marina offers mooring with a permit (available at the convenience store). At the dock you can also fuel and service your boat. The marina also has a convenience store to purchase bait and tackle, as well as, a fishing guide service. Being the largest Kokanee Salmon fishing spot in the United States, these services are more than useful. Along the Marrow Point Reservoir, boat tours are offered. 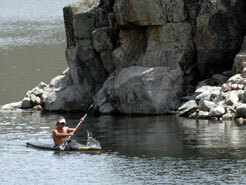 The tour travels through the upper Black Canyon of the Gunnison on a 42-passenger pontoon boat. The tour runs 1.5 hours (reservations are required). Popular recreation activities include wind surfing, waterskiing, and in the winter excellent ice fishing. Other activities that are not water based are visiting the 5,000-acre archeological district and exploring the old Narrow Gauge Railroad of Gunnison. Rangers in the area will give you the history of this old mining railroad. Hiking is another popular pastime. In the area, there are trails ranging from easy to very strenuous. Close to the park, you can also visit the Black Canyon of the Gunnison or the Gunnison Gorge National Conservation Area. Visitor centers are located at Elk Creek Marina and Cimarron. There are also overlooks at Dillon Pinnacles trail and Hermit's Rest trail. Access the park via Highway 50 which runs the length of the recreation area between Montrose and Gunnison. A PREMIER FISHING EXPERIENCE in GUNNISON: Guided Lake, trolling, ice-fishing for Rainbow Trout and Kokanee Salmon on Blue Mesa Reservoir. WINTER Ice fishing from Mid-December to Late-March.